How do you get 50 programme countries, four regional offices, one global HQ and 20-odd fundraising offices on the same Facebook page, if not literally, then at least figuratively? That’s the question we've been asking ourselves at Plan International, a global children's development organisation, for the past three years – and we now think we have something vaguely resembling the answer. 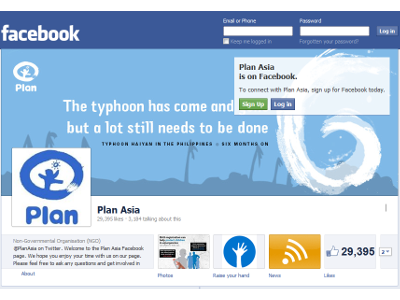 When I joined Plan's Asia Regional Office as web and social media editor, there were frowns, mutterings and general confusion as to why the organisation had started hiring staff whose sole jobs appeared to be playing on Facebook. But times they were a-changing and it was evident that Plan had a little catching up to do in the digital comms race. We started out like any enthusiastic yet apprehensive charity does. We had a global Facebook page and a handful of other pages that our more adventurous offices, primarily those raising money, had started by themselves. But the content we were creating and communicating was sporadic, haphazard and uncoordinated. No one Plan entity was really in tune with another, but the higher-ups and decision-makers were coming round to the idea that social media could potentially add a great deal of value to what we were doing. Country directors started asking questions about how they could use social media in their countries. At first, we weren't really sure. We took stock of what we had, set up regional social media profiles and began encouraging our country offices to get involved. We tried some of our countries out on Facebook and Twitter and set up umpteen new accounts, only to learn that Twitter just wasn't the right medium through which to do what we wanted at the country level. But we also encountered other stumbling blocks. It wasn't really anyone's job in our country offices to do social media, so while it fell to the comms team (often just one person) to ‘do something’, it had to be worked into schedules full of everything from advocacy and events to media trips and pitching. Facebook seemed to be the best platform for us. Our comms staff at the country level almost universally ‘get’ Facebook – and not only that, but they enjoy using it. All they really needed was a little support and pointing in the right direction. This pointing came in the form of training, ideas for how to source content, strategies and help setting up things like editorial calendars based around themes. We made sure to always be there to offer support when needed. This was enough to get many of our countries interested and taking pride in building up their Facebook pages. Even more interesting was when they started making social media part of someone's job description. This was progress. What helped keep all this together was the development of a definitive, organisation-wide communications strategy and a set of social media guidelines to help ensure we were all speaking with the same voice. Once we could visualise and categorically say what it was we were aiming for as an organisation, the rest just seemed to fall into place. This leadership from our HQ helped everyone to figure out why the heck we were investing so much time into playing on Facebook. Once our country offices were in the game, we started putting a little money into their Facebook pages to boost their audience size, using advertising to specifically target people in the respective countries who we thought would be interested in what Plan had to say. Our overall goal is to improve the lives of children and so by investing in advertising we can reach more sponsors and donors on a local level right through to a global one. Now in Asia, we have a regional Facebook page with 23,000+ likes and 11 country pages with audiences of up to about 9,000 people a piece, with the exception of Plan India with its mega 250,000 fans. Those numbers on their own aren't going to set the world on fire, but then when you take into account that these pages are communicating with one voice and one vision in line with our offices in Africa, South America and the rest of the world, then you start to see the potential reach we can have with our messaging. With our headquarters working closely with our regional offices, we've been able to achieve much more together than we ever could as single entities. And that is how we get everybody on the same Facebook page.